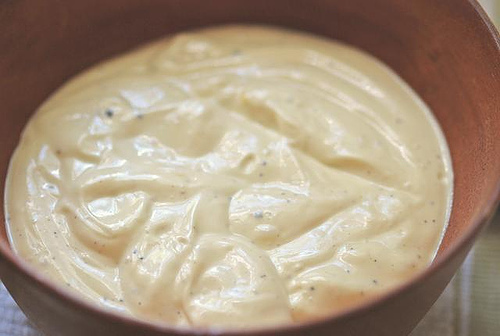 Everybody should be able to make this simplest of the emulsion sauces without using a food processor, though I realise that, with the time constraints we all have, the food processor method will win every time. Make it by hand just once as it will help you to understand the properties of an egg yolk. There are a few points to remember whether you are making mayonnaise by hand or with a food processor. If these are kept in mind, the dreaded ‘splitting’ can be avoided. All ingredients should be at room temperature. Warm the bowl in which the mayonnaise is to be made in hot water before beginning and dry it thoroughly. This will take any chill off the egg yolks. Heat the oil to just tepid if it has been refrigerated. The egg yolks must be well beaten for a minute or two before adding anything to them. This will help them absorb the oil better. A little of the acid, that is, the vinegar or lemon juice is then added. This seems to help the oil absorption. The remainder is added at the end. The oil should be added very slowly at first, just drop by drop, until the emulsion process begins and the sauce incorporates into a heavy cream. After this the oil can be added more rapidly. The maximum amount of oil one egg yolk can absorb is about ¾ cup (185ml, approximately). As soon as this volume of oil is exceeded, the mixture will curdle. It is better to measure out the oil for the number of eggs you are using before you begin than risk having to re-incorporate a curdled mess with additional egg yolks. Warm the mixing bowl in hot water and dry it thoroughly. Add the egg yolks and, using a wire whisk, beat yolks until they are thick and sticky. Add the tablespoon vinegar or lemon juice, the salt and half teaspoon of mustard. Whisk for a further 30 seconds. The eggs are now ready to receive the oil and while it goes in, drop by drop, you must not stop beating until the sauce has thickened. Add the drops of oil with a teaspoon, or rest the lip of the bottle on the edge of the bowl. Keep your eye on the oil rather than on the sauce. Stop pouring, but continue beating every 10 seconds or so to be sure the yolks are absorbing the oil. After 1/3 – 2/3 cup of oil has been incorporated the sauce should thicken into a very heavy cream. Once this has happened, the remaining oil may be added 1 tablespoon at a time, whisking well to incorporate between each addition. If the sauce becomes too thick, thin it out with a few drops of lemon juice or vinegar, then continue adding the oil until all is incorporated. Beat the boiling water into the mayonnaise. This is insurance against curdling. Add extra vinegar or lemon juice and mustard to taste. I promise to post the “food processor” version which is REALLY easy…tomorrow!